Education Qualification : Passed Post Graduation Degree in Concerned Subject with minimum 55%(SC/ST- 50%) Marks and 2nd Class Graduation Degree from any Recognised University. 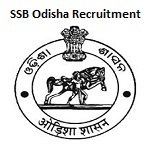 Eligible Candidates can Submit Application at the Official Website of SSB Odisha Latest by 11th December 2018. Applicants First Logon to SSB Odisha Official Website. Open Online Registration Link for Lecturers in Non Government Aided Colleges of Odisha. Now Click on Proceed to Apply Online Link.